Heidi Blickenstaff, Susan Blackwell, Jeff Bowen & Hunter Bell in "[title of show]"
The beloved musical [title of show] will once again be heard on Broadway in a concert staging set for March 11 at 7:30pm at The Broadhurst Theatre. The one-night-only event will reunite original cast members Hunter Bell, Jeff Bowen, Heidi Blickenstaff and Broadway.com contributor Susan Blackwell, along with musical director Larry Pressgrove. All proceeds will benefit The Actors Fund. With a Tony-nominated book by Bell and a score by Bowen, [title of show] follows collaborators Hunter and Jeff alongside their best friends, Susan and Heidi, as they try to write a new musical while retaining their artistic intentions without selling out. The original production of [title of show], featuring direction and choreography by Michael Berresse, opened on July 17, 2008 at the Lyceum Theatre. 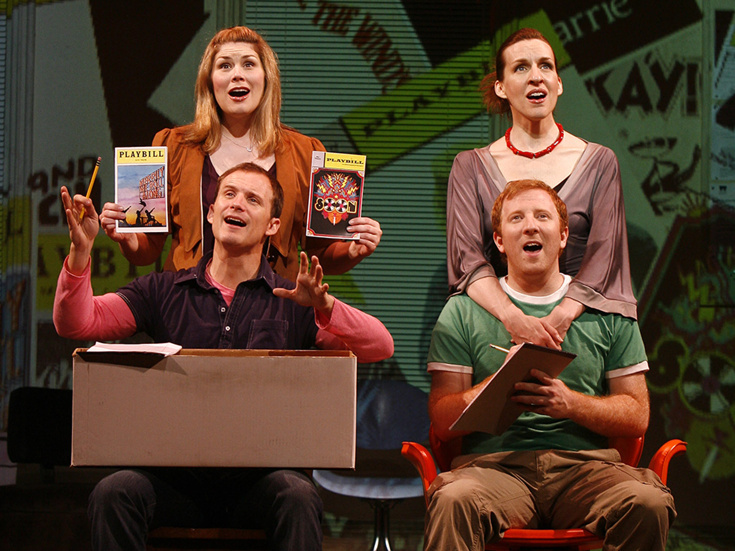 It received its first production at off-Broadway's Vineyard Theatre in 2006. Look back at Broadway.com's opening-night coverage of [title of show] below.